Mayapple Books and I are happy to announce the publication of Marie-Antoinette, Daughter of the Caesars: Her Life, Her Times, Her Legacy, available internationally from Amazon. It is my first non-fiction book. Whenever possible I have let the historical persons speak for themselves out of memoirs and letters. I try not repeat too many of the well-known anecdotes that are rehashed in other books but if I do, it is to look at the incident from a different angle. I will cite other biographies as well throughout the course of the book. As for the subtitle, Daughter of the Caesars, I think it is important to see Marie-Antoinette in light of her Imperial heritage as a child of the Habsburg dynasty. The Habsburgs assumed the crown of the Holy Roman Empire in the 1400’s, the crown which had originated with Charlemagne in the year 800, seen as the continuation of the Roman Empire of the West. The Habsburgs and their allies kept the Muslims from overrunning Europe at both the Battle of Lepanto in 1571 and at the battle of Vienna in 1683. Indeed, the four crowns which adorn the tombs of the Habsburgs in the Capuchin crypt in Vienna are the crowns of the Empire, of Hungary, of Bohemia, and of Jerusalem, the latter being a throwback to the days of the Crusaders. In those four crowns are symbolized much of the history of Christendom. The fall of Marie-Antoinette, as both Queen of France and the youngest daughter of the Imperial Family, is indicative of the end of Christian civilization and the birth of the secular state, which was the object of the French Revolution. Through her death, Marie-Antoinette has been dubbed “Martyred Queen of Christian Europe” for in killing her the revolutionaries also symbolically killed all that she represented, the ancient heritage of Christendom. The Paradise Tree opens in 1887 Ontario, where a clan mourns the death of family patriarch Daniel O’Connor, an Irish immigrant who has lead a tough life peppered with illness, battle and many struggles. Through it all Daniel and his wife have kept their faith and passed it on to a new generation; and now it’s up to grandson Fergus to take these family values and move on. Readers seeking a spicy immigrant saga replete with Catholic faith and the search for spiritual and social freedom will find The Paradise Tree is just the ticket: it’s historical fiction writing at its best, bringing alive not just the events of one man’s life, but the underlying motivations, perceptions and struggles it embraces. There is a distant isle/Around which sea-horses glisten;/Let not your intoxication overcome thee; Begin a voyage across a clear sea . . . .
Daniel thought of the legends of the western seas and the Blessed Otherworld, which even holy monks like St. Brendan had sought to find. An inexpressible yearning welled in the depths of his being, as if something indefinable called to him from far away. Poetic, lyrical passages skillfully capture these motivators, which range from social and political change to failed crops and specter of starvation and a clan’s survival. No punches are pulled: this is also a story of addiction and depression: facets that many immigrant stories leave out when recounting struggles. …So harsh were the laws that many Protestant authorities would not enforce them, and looked the other way. The religious orders, the Franciscans, the Dominicans, and the Carmelites did not abandon us, but kept the faith of our people alive. They built tiny chapels, but those were few and far between. In my grandparents’ day, Catholics went to Mass in private homes, at the back of the pub, or in the open fields at places called scathlans or Mass rocks. My parents went to hedge schools in the countryside, and the brave Presentation sisters taught many Irish children in and around Cork.” “I suppose it would have been easier for the Irish if they had all become Protestants?” Fergie wondered. Now that he was going to school, he was acutely aware that not everyone in the world was Catholic. The grandfather chuckled at the idea, so unthinkable that it was humorous. “Aye, easier to live, Fergie lad. Easier to live, but not easier to die. The Paradise Tree is a solid example of historical fiction at its best, illustrating the circumstances affecting its protagonists and capturing the drama of lives well lived. The fact that it’s all based on the author’s own family heritage (“…elements of The Paradise Tree were gleaned from private family papers and unpublished or privately published works, including assorted letters, newspaper clippings, and legal documents.”), documenting how the author’s family emigrated from Ireland to Canada, just makes it all the more compelling. Author and historian Gareth Russell sinks his teeth into the third edition of Trianon. 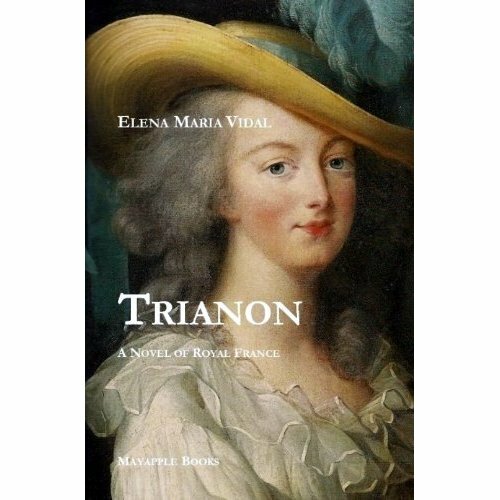 Over the next few weeks, there will be a series on the work of the American novelist, Elena Maria Vidal, beginning with this review of her first novel, Trianon, based on the final years of Louis XVI and Marie-Antoinette. Recently re-issued, a new edition of its sequel, Madame Royale, is due out very soon and I was beyond honoured to be asked to write an endorsement for it – so there will be more news on that! There will also be an interview with Elena Maria Vidal, herself, and an article on the society beauty, Gabrielle de Polignac, comparing her presentation in Miss Vidal’s novel, my play The Audacity of Ideas, Sofia Coppola’s movie Marie Antoinette and Chantal Thomas’s novel Les Adieux à la reine. There will be a discussion on Miss Vidal’s latest novel, The Night’s Dark Shade, and an excerpt from my thesis about the portrayals of Marie-Antoinette in cinema. On Miss Vidal’s superb blog, there is already (very kindly) an excerpt from my thesis, in which Trianon was discussed when I was researching the posthumous reputation of Marie-Antoinette. It was my pleasure to review this novel and I hope the events over the next few weeks will keep people entertained! Nothing happens in Elena Maria Vidal’s novel Trianon. In much the same way as nothing really happens in Michael Cunningham’s The Hours. Yes, Marie-Antoinette is executed, in the same way as Virginia Woolf drowns herself at the beginning of The Hours, but “real drama” (whatever that is) never seems to happen. It’s all internal – it’s the story of people, rather than events. Trianon begins with the famous court artist, Elisabeth Vigée-Lebrun, painting a portrait of Marie-Antoinette, in the crisp autumn of 1787. The Queen of France is approaching her 32nd birthday and Madame Vigée-Lebrun has already painted Her Majesty’s portrait several times before. Yet, each time, she is dissatisfied with the result – the artist, that is, not the subject. Madame Vigée-Lebrun, generally considered the finest portraitist of her generation, is frustrated with herself because “her previous attempts at reproducing on canvas the most radiant skin in all Europe, perhaps in the world, had fallen far short of her own high standards”. I loved the opening to this novel, if for no other reason than the fact that, to me, it seemed as if it’s a rather lovely moment of self-portrait. Madame Vigée-Lebrun may as well be Elena Maria Vidal – having once been under the impression that the beautiful young queen was a frivolous, if charming, self-obsessive, Madame has now been exposed to her enough to have an entirely different opinion of her character. She sees her as kind, gracious, elegant, gentle, completely devoted to her children and – in short – a true lady. She is utterly feminine. And it is this high regard in which she holds Marie-Antoinette that makes Madame Vigée-Lebrun so keen to produce a believable portrait of her. Like her character, one senses that Elena Maria Vidal, having spent years researching the true personality of Marie-Antoinette, was determined to render a different kind of portrait of her, but one which captured the radiance that both she, and Madame Vigée-Lebrun, felt had been Marie-Antoinette’s in abundance. World Wide Web–The second annual Catholic Writers’ Conference LIVE will be held August 4-6, 2010, at the Scanticon Hotel Valley Forge in King of Prussia, PA. Sponsored by the Catholic Writer’s Guild and the Catholic Marketing Network (CMN), and held in conjunction with CMN’s annual retailer trade show, the Catholic Writers Conference LIVE provides Catholic authors with a prime opportunity to meet and share their faith with editors, publishers, fellow writers, and bookstore owners from across the globe. This year’s conference will feature presentations on such topics as market tips and time management for busy writers, poetry, creating evil characters, working with an editor, creating winning proposals, journaling and much more. Speakers include Catholic publishing representatives Mark Brumley – CEO of Ignatius Press, Claudia Volkman – General Manager of Circle Press, Regina Doman – acquisitions editor for Sophia Institute Press, and Tom Wehner – Managing Editor of the National Catholic Register, all of whom will also hear pitches from writers. Registration costs $85 for CWG members, $95 for non-members and $42 for students. There’s also a discounted combined membership. To register or for more information, go to http://www.catholicwritersconference.com. On May 16, 2010 at 2 pm in Gardiner Social Hall of the Activities Center of Our Lady of Victory Catholic Church in State College, PA. I will be giving a talk about being a Catholic novelist in contemporary society. The discussion will be accompanied by a reading and book signing. Coffee will be served. I will also be speaking at the Catholic Writers Conference Live during the Catholic Marketing Network Trade Show, August 4-6, 2010 in King of Prussia, PA at the Radisson Hotel Valley Forge. I’ll post more details about dates and times as I receive them. The ebook of the Catholic Writers Conference Online 2010 is now available. I am honored to have my presentation included in it. Go HERE and click on the DONATE button on the right-hand side (third topic down). Donations of $10 or more get the e-book.